Almost two months ago, I reviewed technology new to me that blew me away in less than half an hour. But (and maybe this is just my nature), I have a minor gripe or two. I tried to tweet this particular gripe (and a recommended solution) to the manufacturer, but explaining this requires pictures and more words than a tweet can handle. Hence this post. The gadget? My Livescribe digital pen, which I wrote about here. My gripe? I want to order supplies online from within the Livescribe Desktop software. 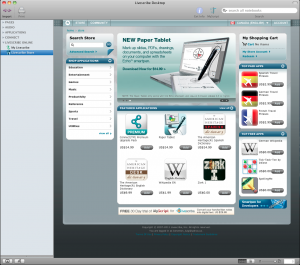 I can order apps: check out this screen shot from the Canadian store. Notice a difference? All Livescribe can sell from the Canadian store is apps, while the store can sell US customers pens, paper, ink cartridges – everything. 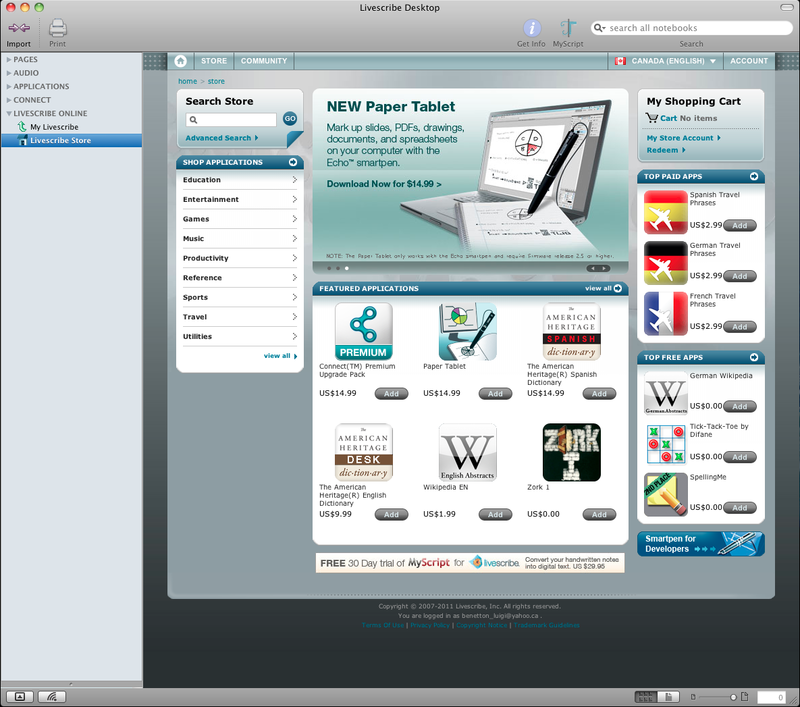 There’s a Canadian web store called smartpencentral.com that markets and distributes Livescribe products to both the US and Canada. 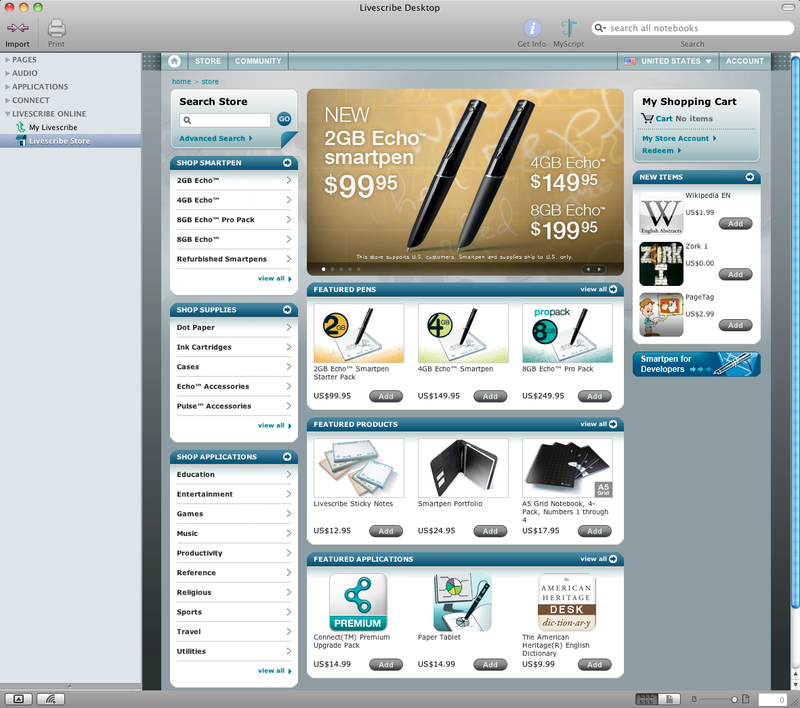 I wouldn’t suggest that Livescribe replace its US store with smartpencentral.com, but it wouldn’t hurt to get Livescribe programmers to put smartpencentral’s Livescribe store in Livescribe Desktop. This move would help the Canadian supplier and raise the Canadian store’s profile to the same level as the US one. That’s it. Both matters seem easy enough to fix. If anybody at Livescribe wants to ask me about my software enhancement requests, just let me know. While you’re at it, did I overstep a boundary by creating and posting a pencast that’s over an hour long?